Wow, long time no blog! It’s amazing how life gets in the way of sharing. I’m sorry I ignored my blog for so long. I made a free printable for all of you to make up for my absence. I have created a Jamberry Wish List for all of you. It has spaces for your favorite wraps, lacquers, Skinnies, TruShine gel and ColourCure and has a checkbox for other popular items you may want to see in your Holiday Presents. I have also included my contact information so you can give your wish list to anyone. If you prefer you still can give me your wishlist and the contact information of people who shop for your presents and I will help them shop for you as their personal shopper. I want you to get the items on your wishlist as easily as possible. Please feel free to download and print as many copies as you wish. Is it really Monday or Tuesday Blues or are you unhappy in your job? I saw this shared on a friend of mine Facebook Wall and my first thought was WOW! How sad you don’t love what you choose to do for work. I know everyone has a bad day at work, especially after a long weekend like we just had with Memorial Day. I know I don’t want to go through Five Stages of Getting Ready For Work daily. In my mind we should do what we love. Ironically my motivational text today stated the same thing. Choose a job you love, and you will never have to to work another day in your life. I am also living in the real world and know jobs in your chosen field may be hard to find or cause stress on the worker and the family when there is more month than money. You could choose to be unhappy or add a side income that does make you happy. We all have a passion. My husband turned his barbecuing hobby into a side business. I turned my trying a nail wrap since I have issues painting my own nails into a successful business. Find your passion and run with it. Your outlook of life will change when you love what you do day in and day out. Since most of you follow me for my nails I will leave you with my Food for Thought I like closing my nail parties with. Next time you go to the nail salon, ask them for a gel manicure AND pedicure with precision lines and designs on each nail for only $7.50. Then ask them to give you 8 more manicures and pedicures, a heater to apply them, enough accent wraps for 500 more manicures all the tools you’ll ever need and a cuticle oil pen for $99. Then tell them that you want a 30% to 40% discount after that for life. Tell them you also want to earn a trip to the Dominican Republic for FREE. Tell them that you want to meet and hang out with other manicured and pedicured ladies at Walt Disney World where you will get even more free stuff! Tell them you also want the ability to get free and half priced manicures and pedicures.Tell them you want to be paid every Friday and once on the 10th of the month for every time you recommend their products or send your friends in the store to have their nails done. How do you think they will respond? 💅 Kitnapper: Just want the kit and discount on some awesome products – no need to sell! Grab the kit and run! 💅 Splash of Cash: You want the kit, discount, some extra income, free and half priced products: work your business how you like. Remember life is short you should enjoy what you do and who you spend it with. Have a wonderful Tuesday! 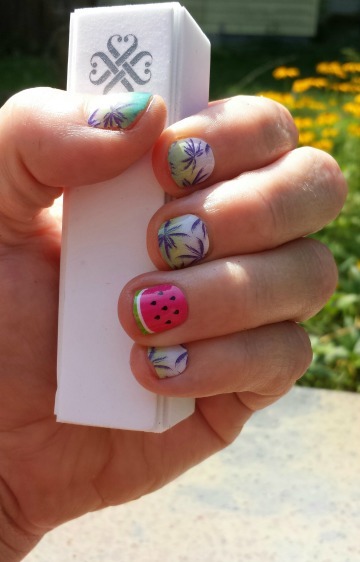 Interview with Carol Hogan, a Jamberry Nails consultant. I was interviewed by the blog. Interview The Reps.
What made you decide to join a Direct Sales company? What company did you join, and why did you pick that company? How long have you been working in Direct Sales? What is your favorite thing about working for a Direct Sales company and owning your own business? How do you convince others that joining your team will benefit them? ​Convincing others to join is not how I run my business. I will ask people if they have ever considered doing what I do. I ask everyone one this, just like I ask if they had fun at the party they just attended and if they want to host their own party. You never know what that answer will be. I love hearing their answers and helping them make an informed decision themselves. I would rather have a customer that will host parties and refer their friends to me instead of convincing them Direct Sales is for them when they don’t want a business right now. Direct sales may not be for them right now, but you never know what the future may bring. Your customers are always watching how you run your business. ​I do home parties, catalog parties, and online parties. For my online parties I prefer to use my Meet.fm room it is closer to a home party experience, but will do Facebook or Skype parties if requested. My Jamberry Nails website has a tab with the capability to request a party with me. Please visit Interview with Carol Hogan, a Jamberry Nails consultant.. When it comes to nail art, there are dozens of different trends out there, but the Accent Nail trend is undoubtedly one of the biggest. Also known as a ‘party nail,’ an accent nail can quickly take your manicure from standard to sassy! Have a friend or family member who is a little hesitant to jump into the nail art pool? Accent nails are a great way for them to dip their toe (or finger) in to the world of Nail Art. A lacquer based manicure with a coordinating accent nail wrap can act as a gateway into fully adopting nail art onto all ten digits. Have an upcoming occasion that may call for a mani that is a little more subdued or simple? Maybe a wedding, or an interview for a new job? An accent nail is a great way to keep your nails ‘event appropriate’ yet not too ordinary. Use a neutral or classic colored base for your manicure and then add that little extra pop with a tone on tone nail wrap. If the event is not too formal, you can go for the bold accent nail that features a contrasting color. An accent nail can be a fun yet subtle way of making an announcement, declaring your allegiance, or sharing your fandom. Try a neutral colored manicure with either a pink or blue accent nail to make a baby announcement. Rock your schools primary color with a collegiate wrap accent to show which side you are on during rivalry week. You could even celebrate a holiday or pop culture event – Jaws inspired accent nail for Shark Week anyone?! These ‘reasons’ to try an accent nail are only a few of many, but really who needs a reason? In our book we think accent nails are a do pretty much all of the time! With a new catalog out for fall, we can’t wait to see what nail wrap you accent with! 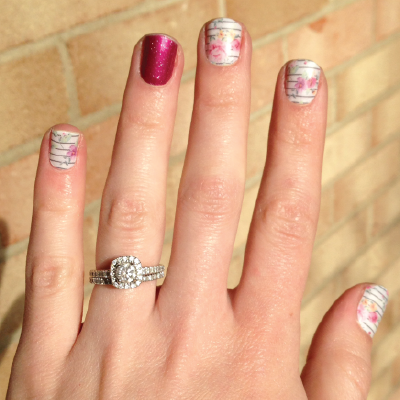 Have you heard about Stylebox by Jamberry? Stylebox by Jamberry is a monthly subscription service. Each month you will get 1 catalog item, 1 Stylebox exclusive item, nail file and orange stick delivered to your mailbox. Who knew Jamberry could make your mailbox more stylish?! This is what was in my mailbox this morning. Orchid is still a big hit of the summer and is carrying over into the fall months. It is not too late to get this look. Simply visit http://bit.ly/choganstylebox take a quiz on your fashion style then decide how long you want your mailbox to visited by great fashions. August is the last month I can offer open enrollment. Starting September 1,2014 I will only have a handful of invitations each month. Don’t miss out on the fashions you want! You do not have to take my word on Stylebox. Imagine my surprise when the blog I read, Sassy Moms in the City, had a post about it on July 29,2014. Read the review for yourself here: http://sassymomsinthecity.com/stylebox-by-jamberry-review/ There is one thing I disagree with. While it would make a great gift for the teenager in your life, women of all ages love Jamberry Nails and would love a monthly Stylebox by Jamberry. Psst… Have you Heard what is coming on October 15, 2013? Jamberry Keeps getting better with Nail Lacquer. ❤ You love our nail wraps. ❤ You love our cuticle oil. ❤ You love our application kits. ❤ You love uploading your own images for your own custom nail wraps. I know you will love our new Nail Lacquers which will be available to order on October 15, 2013 for those in the US,APO addresses and Canada. 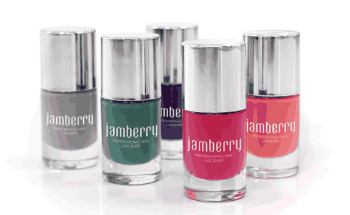 Jamberry Professional Nail Lacquers provide 5-free* salon quality coverage, with vibrant colors that complement many of our nail wrap designs. These nail lacquers are perfect for the ever trendy statement nail, pesky pinky toes, or under any of our clear nail wrap designs! Prep your nails for a smooth application with our extraordinary base coats. Enhance the look of your nails with our trio of top coats. *5-Free: Our lacquer does not contain Dibutyl Phthalate (DBP), Toluene, Formaldehyde,Formaldehyde resin, or camphor. See my online catalog http://chogan.jamberrynails.net/home/catalog.aspx page 28 for all the colors available. Want to earn yours or go Holiday shopping for free? I'm booking Facebook parties that offer great rewards for you!